'He Who Dared and Died', Chris O'Dowd's biography was written by his nephew, Gearóid and published in September 2011. When Stirling got the go-ahead to form the SAS, his handpicked team included the young Chris O’Dowd. After his outstanding performance on the early SAS behind-thelines raids on enemy airfields, O’Dowd was awarded the Military Medal and promoted to Lance-Sergeant. The SAS spearheaded the invasion of Sicily in July 1943 and then was ordered to the Italian mainland. Tragically, Chris O'Dowd was killed in action along with fourteen others in October 1943. This book is a fitting memorial to a courageous soldier whose example has inspired, and been emulated by, successive generations of SAS elite. Chris behind enemy lines, the Great Sand Sea desert, 1942. At Fuka Aerodrome on the 8th July, 1942, Sergeant O’Dowd assisted to destroy 30 enemy aircraft. While engaged in a raid on Benghazion the 14th September, 1942, he was in the last vehicle to leave, covering the withdrawal by accurate and sustained machinegun fire which drew the defenders’ fire from the main withdrawing party. On the 23rd October, 1942, Sergeant O’Dowd was the senior N.C.O. of the raiding party which attacked an enemy convoy driving from Siwa to Mersah Matruh, assisting in destroying four Lancias. On the 26th October, 1942, he assisted in blowing up the railway line west of Mersa Matruh. On the 1st November, 1942, he was the senior N.C.O. in a party of six which strafed traffic at Sidi Barrani and then attacked a railway siding, capturing eighteen prisoners, four machine-guns, blowing up the railway line and destroying wireless equipment. Since its formation within the dark days of the Second World War, the SAS has become legendary. The successful release of the hostages from a London embassy was televised worldwide. It is a unit which has been almost constantly involved in every conflict and terrorist situation possible. But how did it start? This is the story of one of the original SAS members. Chris O'Dowd was an Irish boy who ran away to join the Irish Guards aged 18. 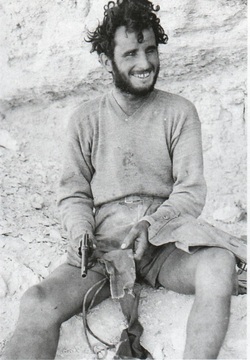 His involvement in the Norwegian campaign and the North African desert led to him being hand-picked to be a founder member of the SAS. His tale is a poignant one for he was one of the soldiers who never came back from war. Yet his courage won him the Military Medal. This is more than just a standard book about the formation of an elite military unit - it is the story of a boy who became a man in battle and died in the process. It offers a glimpse of the lack of confidence that many in the army possessed with regard to the SAS - they did not believe that it had a role to play. The resultant story of a unit flourished against all odds, and of an Irish boy who never expected to get caught up in war. This is a book which will appeal to anyone who is interested in military history of the Second World War. It is well written, and meticulously researched. Written by Sergeant Chris O'Dowd MM'S nephew He Who Dared and Died is an account of a young Irishman, who, brought up in poverty in the West of Ireland, ran away to join the Irish Guards aged 18. O'Dowd soon experienced action in Norway but, hungry for more, he volunteered for the newly formed Commandoes. After intensive training, he sailed for Egypt and came into contact with David Stirling. When Stirling got the go-ahead to form the SAS, his handpicked team included the young O'Dowd. With the recent release and publicity surrounding the publication of a wartime SAS diary, this book is is a timely new release., It is proof that there are many more stories of the SAS still to be told, full of adventure and daring. It covers the story of a young Irish soldier who joined the Irish Guards at the age of 18, he had been brought up in poverty in the West of Ireland and had ran away from home to join up. This book written by his nephew is a fitting tribute to a brave man, It is a story of courage and is a respectful tribute to an Uncle he never knew, other than from a faded picture which had pride of place on his Grandmothers wall. An excellent read. Chris O'Dowd was one of many Irish volunteers who chose to fight in the British army during the Second World War. After a period in the regular infantry which saw him take part in the Norwegian campaign, he joined the Commandos and then moved on to the newly formed SAS. He took part in many of the early raids in North Africa and the invasion of Sicily, but tragically was killed early in the campaign in Italy. The author is Chris O'Dowd's nephew. He was intrigued by the story of his lost uncle, but only recently was able to found out any details of his life. That led him into more research, and the production of this book. We follow Chris from his childhood in the west of Ireland, through his decision to join the British army and his early experiences in Norway and with the Commandos. His story is then intermingled with that of the SAS, starting with its formation as a tiny force and its early missions. The two stories run in parallel for the rest of the book, so O'Dowd's experiences are placed in the wider context of the SAS (and in particular the development of SAS tactics in North Africa and the changes forced on them by the move to Sicily). This is genuinely a story that needs telling. Some 70,000 Irishmen fought in the British Army during the Second World War, and for many years they were treated fairly appalling at home. That has now changed, allowing the role men like Chris O'Dowd played in the fight against Nazi tyranny to be properly recognised. Given that O’Dowd has a background as a musician and then a journalist this may seem a strange topic for him to write about until one realises that the subject of this biography is his uncle. The involvement of Irishmen such as Blair Mayne in the SAS during the Second World War is quite well known although the attention has usually been to the officers. Formed as a special force to operate behind enemy lines in North Africa, the SAS carried on unconventional warfare and consequently attracted unconventional soldiers. Written very much in a ‘Boy’s Own’ style this is an admiring account of Sergeant O’Dowd and his career. Apart from the adventures, he served with some interesting people such as Randolph Churchill, son of the Prime Minister, and novelist Evelyn Waugh. One of the most recent of our History Ireland Hedge Schools was in the National Library in May, and it dealt with the thorny topic of ‘Irish Army deserters and the morality of neutrality’. A rather lively discussion ensued to say the least and given that the Hedge School dealt with the subject of Irishmen who fought in the Allied forces during the war, curious readers might want to get a sense of what those Irish soldiers experienced. A striking (if untypical) example is provided in Gearoid O’Dowd’s He Who Dared and Died. It is the story of Chris O’Dowd, the author’s uncle, who was born in Mayo but became one of the first recruits to David Stirling’s Special Air Service (SAS) and was killed during the Allied invasion of Italy in 1943. L Detachment SAS en route to a target. Chris in the tunic of the Irish Guards. AVAILABLE WIDELY ON-LINE AND IN-STORE AT ALL GOOD OUTLETS.